And yet the Rev. 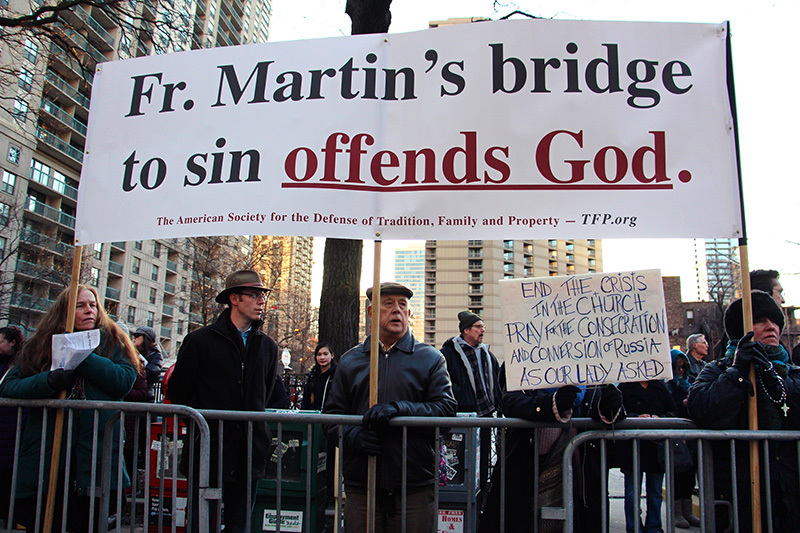 James Martin, speaking on the topic at Holy Name Cathedral on Thursday evening (March 22), attracted about 150 protesters. Across the street from the church, they sang hymns and prayed the rosary. They held signs saying “Fr. 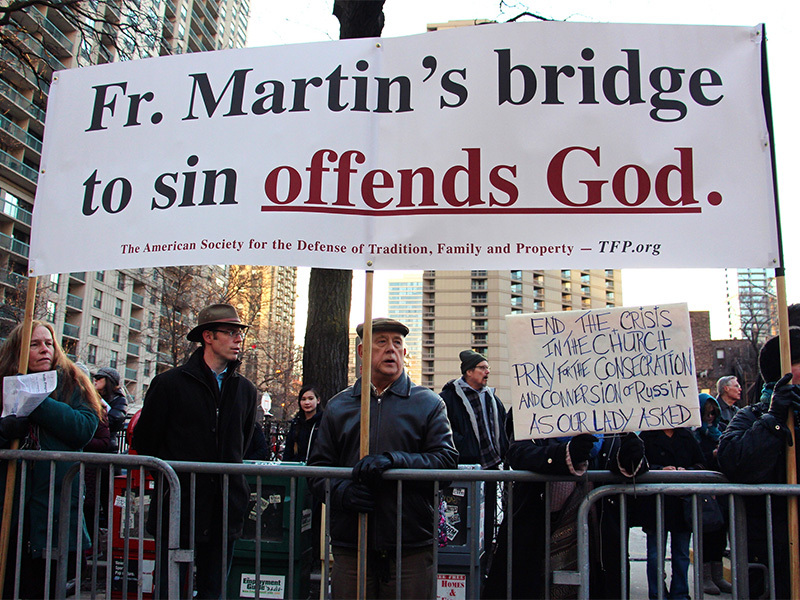 Martin’s bridge to sin offends God” and “Sin creates chasms not bridges” — references to the title of his book, “Building a Bridge,” which urges dialogue between the Catholic Church and LGBT people. 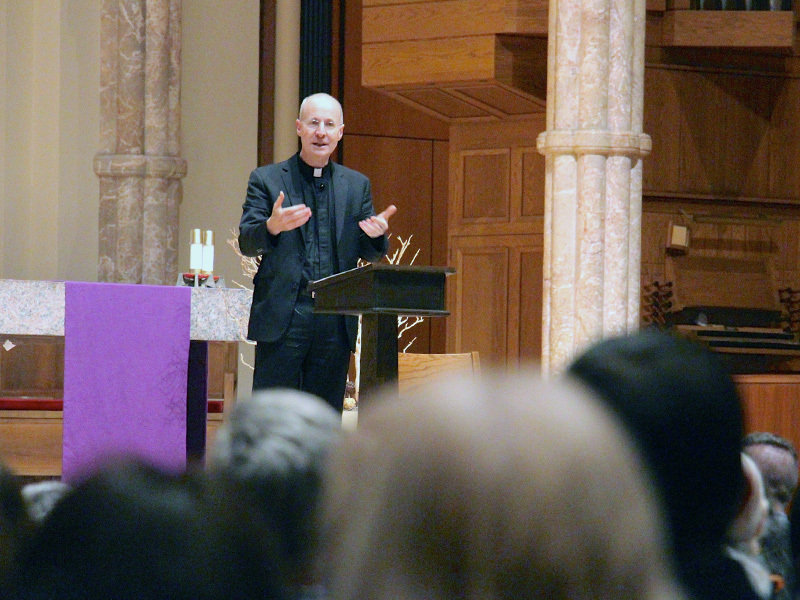 Supporters too turned out at Holy Name for the first of several talks this week by Martin, who was invited to speak in the Archdiocese of Chicago after criticism of him by alt-right Catholic websites and some conservative Catholic writers. That pushback after the publication of his book last year led to the cancellation of several of his talks. Noell said the group had been part of the online campaigns that led to the cancellation of three of Martin’s talks last fall. That’s when Cardinal Blase Cupich of Chicago invited the Jesuit author to give a series of talks about Jesus — the subject of at least one of his canceled talks — in the Archdiocese of Chicago during the last days of Lent, a penitential season observed by many Christians leading up to Easter. Inside the cathedral Thursday night, the pews were packed. Tickets to the talk, which was often lighthearted, were sold out — all 1,200 of them — and only 20 or 30 remained for the next night’s talk, according to the archdiocese.